This weekend was my fiancee’s hen do. So i decided to make it a 3 day weekend and took the Friday off myself. What was in store for this weekend was nothing but gaming and it went pretty much exactly to plan. Friday morning I took off to my nearest supermarket and picked up a weekends worth of supplies. Pizza, Curry, Chicken dippers, crisps, Chocolates, peanuts, cider, normal drink, sausage rolls, scotch eggs…. yup I think I had all bases covered with supplies. 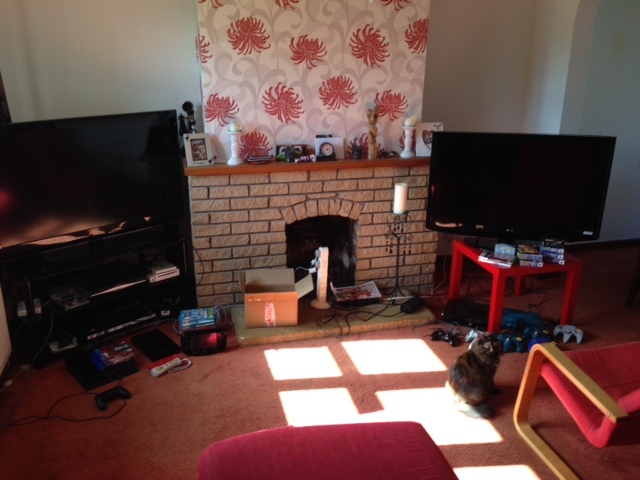 With that out of the way began the task of setting my living room up into geek central. It was quite the task alone, but I knew it would be worth it ultimately. Well eventually my first guest arrived. GSRR’s number 1 fan himself. We hit the N64 straight away. playing numerous games playing each for a couple of hours. F Zero was rather fun, also helped that this was one game I actually managed to be rather consistent on and win the most on. Pokemon Stadium 1 and 2 mini game tournament brought back so many memories and so many laughs too. A few games of Mario Tennis that got really rather tense and one match seemed like it would never end and then of course some Goldeneye. We started off with a play through of the campaign and then ended up on multiplayer as standard. 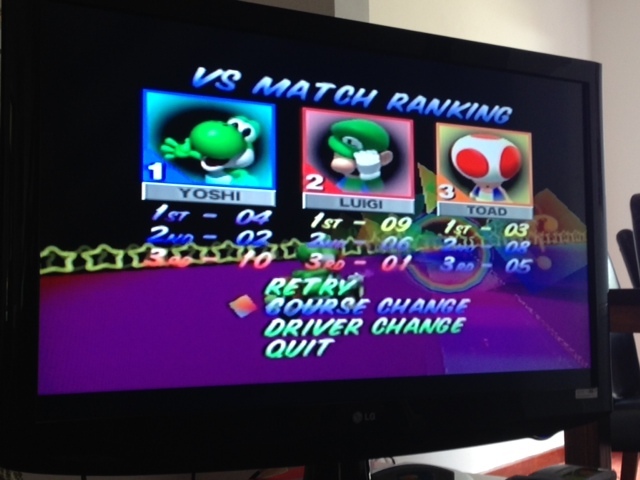 Later in the afternoon another friend came round and we again just played the mini games on Pokemon Stadium 1 and 2. High lights being the Clefairy memory game from Stadium 1 and the counting game from Stadium 2. So far our gaming session hadn’t seen any other console involved. It was all N64, But as we got later into the night we switched to Xbox 360 for some WWE2k14. Around midnight another friend turned up for what would be the final 2 hours of gaming that night. He showed up with reduced birthday cake… this pleased us. More WWE2k14 followed by a few matches of FIFA and we decided to call it a night on day 1. Not long later Will showed up and the madness began. More Pokemon Stadium mini games with 4 players was hilarious. We went through both Stadium 1 and 2 mini games and it seemed to take hours to eventually crown a winner. Of course we went onto Goldeneye and created some specific matches of interest. Throwing knives only and all meeting up in the designated “death room” made for some entertaining moments. Also threw Wrestlemania2000 into the mix too which looked ridiculous compared to today’s games. As the day went on, we went onto the Wii U and had numerous games of Nintendoland. Still can’t stress how fun this game is with more players. After that Will set up his Xbone and he and GSRR#1 tried to play NBA2k14. 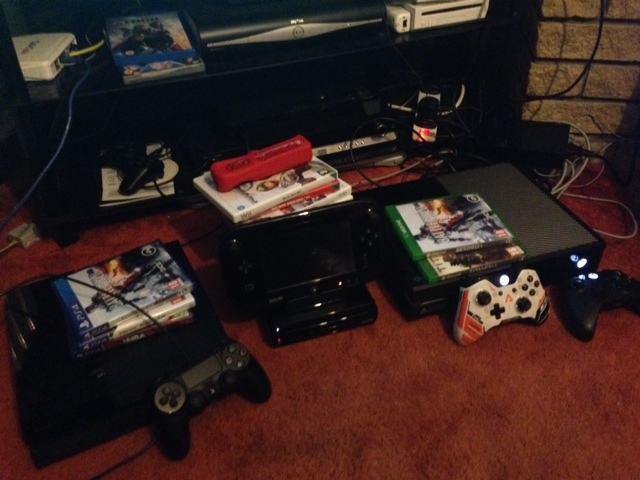 I say try in that it seemed to take a long time to get 2 controllers to register to the console. I opted to play FIFA14 on 360 with my other friend that was over, then we swapped over and tried the Xbone out. I asked Will to demo Titanfall as i’d yet to see it in action. And Will of course obliged. Have to say it looks very impressive and fast paced. It did remind me of seeing Modern Warfare 1 for the first time. This is meant to sound like a compliment as I found MW1 incredible for the first time. Was slightly shocked to learn that only 6 players make a server and the rest are bots. The game does look fun though. Once the demo was over Will made his way home, and the remaining 3 of us were running out of gas after a late night and gaming all day. It was about 12:30 this point. We had another hour on Wii U playing Game and Wario, and then from about 1:30am till 2:20am just watched some South Park to end the weekend on a laugh. It was a truly geeky and funny weekend with a massive nostalgia kick from the N64. I hadn’t really expected it to be the main console of the weekend, but when you look back to how many decent multiplayer games there were for it, you didn’t really need to look elsewhere for fun multiplayer. In fact it was really was a more Nintendo weekend as Wii U probably had the 2nd highest amount of play with the PS4 only seeing 1 game of NBA. the 360 only seeing a few WWE and FiFA matches and the Xbone seeing 2 NBA matches and 2 rounds of Titanfall. So there you are.. Nintendo make for an awesome nostalgic gaming weekend! Friday night I went out with Meg for some drinks as one of her work friends was leaving for London. We had a really good night, but ended up being very drunk, even though I wasn’t planning on it. So on Saturday morning I was feeling a little delicate. But I pulled myself together and made may way over to Murrs for some gaming fun, as he has already mentioned. As Murr said, setting up the 2nd controller was a bit of a pain, but I think I figured out why it wasn’t working properly. Basically you have to sign in a guest, but I was doing this myself, so it was thinking I was the main player and the guest, and I think the console just got confused. We got there in the end though! Murr has also neglected to mention International Track & Field for N64! That was a lot of fun today, and resulted in a lot of furious button bashing. Sunday was a very lazy day. Which pretty much involved binge watching TV. We made a start on watching American Horror Story. I know we are a little behind, but as its now on Netflix we thought we would get it a go. And I must say, it’s actually very good. If you don’t know, it’s about a family who move to LA after the husband has an affair. They are trying to have a fresh start and save the marriage and keep the family together. The problem is, is the house they move to is dubbed the ‘murder house’ for mysterious reasons…. ok, not mysterious, lots of murders happened there. In fact, pretty much everyone who has lived there has been murdered, or murdered someone. It kind of begs the question why people still go there. Or why the police still let people go in there. But hey, if they didn’t then there wouldn’t be a show. Anyway, it’s really good, but also really weird. It’s like desperate house wives meets every horror film, and a lot of horror film clichés. On to the stag do!! What a weekend that was for you guys! Mine was: Minecraft, moulding thermoplastics, reading, blogging, more moulding and more Minecraft. It was pretty good fun! Sounds like yours was pretty good too. I need to get involved in stuff like this! !